At Kingsway Dental Centre, we know the importance of a healthy and complete smile. 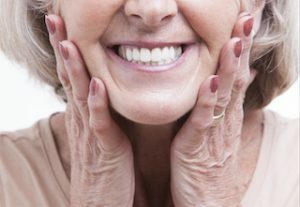 When you have missing teeth, taking action to replace them is important. Because your adjacent teeth can tilt due to a missing tooth, holding that space is important to maintaining the integrity of your bite. One of the most reliable tooth replacement options is a dental bridge. Dental bridges have been around for a long time and remain one of the most common dental procedures. The dentists at our Edmonton dental office have extensive experience in the creation and placement of dental bridges. A traditional dental bridge consists of at least three dental crowns. Each of your teeth adjacent to the missing tooth will have a special crown called abutment crowns that hold your prosthetic tooth (pontic crown) in place. Traditional bridges require us to remove part of your tooth structure in order to place the dental crowns on the adjacent teeth. Traditional fixed bridges are stable and last a long time with the proper precautions and care. Excellent dental hygiene is important to maintain any dental work and to prevent any future dental conditions. With proper care and caution, fixed dental bridges can withstand years of chewing. A one-sided bridge is called a cantilever bridge and is perfect for low stress and highly visible areas of your mouth. They are also useful for bridges with only one anchoring tooth. We attach your bridge to one tooth adjacent to your missing tooth or teeth and complete your smile. Cantilever bridges work well as long as it’s placed in an area with little chewing force. Since we can only anchor it to one tooth, they are not as stable as fixed dental bridges. Maryland bridges are attractive and require minimal prep work to your adjacent teeth. Instead of removing much of the tooth structure, Maryland bridges fuse your artificial tooth to metal bands and then we bond the metal bands to your adjacent teeth. Maryland bridges reserve your tooth structure, look attractive, and work well in low-stress areas of your mouth, like your front teeth. No matter what type of bridge you have, it will require some special care. Because of the nature of dental bridges, you will need to adjust your flossing techniques in order to maintain the health of your gums. Our dentists can show you the methods that will work best for you and even make recommendations for products to help make it easier. Are you missing a tooth? Dr. Jim Haymour, Dr. Everett Postill, or Dr. George Laschuck can perform an evaluation and present you with your options for dental treatment. Once you make a decision, our team will take excellent care of you during the restoration of your smile. Can you fix my missing teeth?